Former WWWF champion Superstar Billy Graham is arguably the most influential WWE superstar of all time. Superstar Graham’s entrance, interviews, in-ring style, and his infamous physique have all been copied by some of pro wrestling’s biggest stars. I had a chance to sit down with the Superstar for an interview to talk about his impact, legacy, opponents, and much more. I had a chance a couple of years back to get to know the WWE Hall of Fame wrestler and talk to him for my radio show, Pro Wrestling Radio. I had no idea what to expect in setting up the interview because you never know what you are going to get from of these old school wrestling greats. What I got from the Superstar was a charming, kind, intelligent, funny, and fascinating side to one of pro wrestling’s greatest heels. Superstar Graham continues to have a very polarizing presence in pro wrestling. I can only speak of my experience with Billy Graham. Superstar suffers from Hepatitis C. During the course of our many pre-interview conversations I brought up to Billy that my mother suffers from Hep C as well. Billy was very interested and offered a lot of great words of advice and encouragement. Following the interview Billy continued to email me and ask about my mom, continuing to offer that same advice. Billy had nothing to gain and we had no personal relationship at all before our first phone conversation. Yet he took time out of his day to continue to check up and show genuine interest in my family. I don’t care what you say about the man, but to me that is first class all of the way. It has not been easy for Billy since retiring from the pro wrestling business. He has had an on again/off again relationship with the WWE and Vince McMahon for about 20 years. Today the relationship is cold, yet that could change tomorrow. His health issues after years of admitted drug abuse are as bad as ever and have drastically impacted his ability to make money on conventions and autograph signings. Yet through it all Billy continues to remain positive and his love for pro wrestling is stronger than ever. While I think the context of the interview remains relevant today, keep in mind that this interview was conducted in 2007. Some topics addressed at the time as current events have changed and I don’t know where Billy stands on these issues a few years later. However, the look back at his historic career remains just as entertaining and informative today as it did three years ago. Eric Gargiulo – What are your memories of wrestling in Philadelphia? WWE Hall of Fame 2004 – See the Superstar get inducted and watch his matces! Superstar Billy Graham – Philadelphia that’s one of my top three favorite towns along with Boston and New York. Philadelphia as far as wrestling towns the fans there just can’t beat, you just can’t beat the east coast fans for intensity anyway, you know? Those folks in Philadelphia there’s, just nothing like it, it’s been great you know? Eric – When you wrestled on the east coast in your heyday in the mid-late 1970s, did your babyface opponents become frustrated when you would wind up being cheered which was very rare for a heel back then? SG – Yeah it eventually you know the fans started making those early posters, “Superstar Billy Graham” and stuff like that, lots of fans started making homemade t-shirts and stuff. I’ve got some great photos that have been collected over the years by fans, now that we have the Internet it’s great you know? Fans can find stuff and email them to me so I’ve got a treasure-trove of photographs from all of my babyface fans when I was heel champ. I think Eric the deal is that the east coast fans are a different breed of fans, they’re far more intense and they really enjoyed being entertained. Philadelphia, I remember almost all of my matches there at the Spectrum, especially that great cage match with Bruno. Eric – What do you remember about that night that you and Bruno turned away thousands of fans at the doors here in Philadelphia against Bruno Sammartino in the cage? SG – That was a great night, I remember I was at the old Philadelphia hotel right there in the Philadelphia airport watching the news and the five o’clock news in Philadelphia was coming on and they were saying that they had 5-10,000 fans outside, out in front of the Spectrum, nobody could get in, don’t go there, it’s sold out, we got all of these thousands of folks on the streets. That event, that cage match with Bruno set the all-time attendance record for the Spectrum at a little over 20,000 fans inside the Spectrum and I remember that they had put extra seats in, and I remember that there was about two feet between the front-row seats and the ring. It was just an awesome, awesome turnout and support of the fans, and of course I don’t think that we let the fans down. I think we gave them a real good match in that cage and that stays with me as probably and other wrestling historians, like Dave Meltzer for instance have said that, that event and my drawing power in the Philadelphia Spectrum, having all of the sellouts that I had there was far more impressive than all of the sellouts that I had in Madison Square Garden because of course of the population, you know 10-15 million people in New York and you are going to draw a lot of folks. To sellout the Spectrum the way we did was really in history far more important as far as historians go than selling out the Madison Square Garden. It’s a great thing, it’s a great compliment, you know? 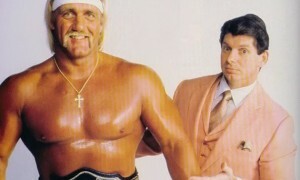 Eric – Bruno has mentioned on my show that he was pressured back in the mid-80s because Hulk Hogan wasn’t selling out the arenas like you guys had in the 70s. Did you feel that you were brought back in the mid-late 1980s for the same reason? SG – I have never analyzed that question Eric but that is great analysis by Bruno. I know that, take me out of the equation and just leave Bruno in. He would be the man you go to when you need a guaranteed draw to fill up the house. I know once I passed the torch over to Bob Backlund that many, many matches Bruno and I were on the same cards in a supportive role of Backlund and his defense of his belt at that time and it was obvious that Bruno was the one that really drew the house. It was a ploy of Vince Sr. to really load the cards up when Backlund took over to make sure there were people in that building, because there was a lot of disappointment when the kid took it, you know? Eric – Was Backlund a difficult guy to work with? SG – Yes to the extent that he was actually petrified, literally frozen with fear at someone; referee, wrestlers double-crossing him and getting a fast count, and getting that belt. He was absolutely paranoid because he knew, sadly he was a loner there was something about his personality. The nicest guy in the world but there was something about his personality, I think it was the fact that most of the boys felt that he was not really deserving of getting that title, especially when guys like you, well actually before you because of your age, were raised on Bruno Sammartino. There was a big and this is an amazing thing, Vince Sr. actually asked Dusty Rhodes and myself more than once how we can get this kid, Bob Backlund to get some sort of charisma. He was lacking in real charisma, you know? Like Chris Jericho has great charisma, he is just charismatic. Dusty and I told him you just can’t manufacture real charisma and Vince, Sr. knew that. He had been around all of the guys, the legends, you know? That was one thing that I think hurt Bobby in his acceptance on a peer level was because that they felt that he had not really paid his dues as far as years, and years, and years, and really had proven himself because he was relatively just an unknown. There was a lot of disappointment about Backlund taking the belt, as a matter of a fact the cage match with Bruno and I in the Spectrum which was a Saturday before the Monday that I gave that belt to Backlund in Madison Square Garden, Bruno was totally unaware that I was going to drop the belt to Backlund two nights later in Madison Square Garden, he actually freaked out about it. He said, “How could Vince make this mistake?” It’s very amazing because Bruno told me told me to and I did fake an injury, a knee injury in our cage match, I would go into the match in Madison Square Garden with my knee wrapped and limping as I went into the ring, to devalue the title change because I had an injury. Eric – What are your thoughts and awareness on the Iron Sheik’s public struggles with addiction? SG – Oh yes I think all of us are aware, you know I have been a subscriber to Dave Meltzer’s newsletter since the 1990s you know, and yes I am aware and it’s a tragic deal and I have no idea why or how. I think it was just his nature to begin with that he was going to go down that self-destructive road, it’s a horrible thing and we have no answers for it. It is one of the modern day tragedies, you know? Eric – Have you had a chance to offer your help to him? SG – No, I saw him and visited with him in Los Angeles two years ago, now maybe three at the Hall of Fame and WrestleMania. We had a great visit out there but I didn’t feel that I was in a place to advise or council him when I was still having all kinds of difficulties, even though I overcame everything. Eric – Can a successful full-time WWE wrestler function at the current state without any kind of dependency? SG – I don’t know about the personal level, ability for the current guys to perform under the extensive traveling schedule. I know that when I was champion, the year I had that belt just about a full year, I was the first wrestler to take it out of the northeast as you probably recall going down to Florida with Dusty, stuff like that. I wrestled around 330 times that year, it was absurd but I wanted to take advantage of it. I had my dependencies, there was no way that I personally could have traveled, could have trained, could have dieted, and could have done the exhausting scheduling without chemical help. Because you know Eric you are going through different time-zones, you’re jet lagged, and your system is so thrown off by jet lag and the irregularity of your schedule, it just wreaks havoc on your physical body. Also a person like me had to throw in the factor of training and hitting the gym every day. I was a bodybuilder and to keep my look I had to get there, fly to a town, rent a car, get a hotel room, eat, go to the gym, get a two-hour workout in, go to the arena, do your deal, get back, eat, go to bed, get up early the next morning, and do the same thing. It’s a horrific, destructive thing on your system. Eric – What are your thoughts on Ken Kennedy publicly calling you out for being a hypocrite and then subsequently being suspended himself for violating the WWE’s Wellness Policy following the Benoit family tragedy? SG – That blindsided me Eric because I have always taken the heat for my own steroid use and never blamed anyone except myself. Except for a period of time when I did file a fictitious lawsuit against Vince McMahon over the steroid issue. I was very saddened by Kennedy’s remarks because I had actually told him in person when I was having my book tour, one of the towns, he was coming off of an injury that he was so talented that he should never consider using steroids to enhance his physique because of his natural talking ability. I told him that I thought he could be another Roddy Piper-type character, and my wife was sitting there with me when we had this hour long discussion. It seemed like he did have a lot of respect for me and I felt sad. I counseled with Jim Ross over that Kennedy reaction and Jim Ross told me that he felt that Kennedy being the great guy that he is, “just needed more time under the learning tree,” a young guy, had not really matured. I sent an email directly to Kennedy through John Laurenitus’ secretary and my first interview that I did, it was on CBS’ Katie Couric, national news on CBS and before I went on the air Linda McMahon called me here in Phoenix from Stanford to thank me about going on the air and distancing the Benoit tragedy from steroids. I did that in my first interview and I got a personal phone-call from Linda McMahon and I reminded Ken Kennedy of that, and every interview that I did I distanced Benoit’s tragedy from the use of steroids. I was very disappointed in Kennedy because he was such a nice guy to me and he probably still is a nice guy, but then to make that stand and then to be exposed. Eric – What are your thoughts on TNA picking up a lot of ex-WWE wrestlers a few years back who left the WWE after not complying with their Wellness Policy? SG – That’s a very good question and I appreciate that. Personally I cannot speak as to the failures or non-failures of drug policies in TNA. I can tell you that their stance evidently from all I have read, and I go back to tell you that all I know is what I read in my friend Dave Meltzer’s newsletter. We’re very close friends Dave and I, and I take his newsletter as gospel. Let me tell you something Eric, it is absolutely the nature of the beast of pro wrestling to be dishonest, to lie, to cheat, to steal, and to deceive. After all, back in the day when we were kayfabing everybody our sole goal was deception to make the thing a reality. We lived that deception you know the stories of the old-school man. Listen to me right now. There is nothing holy there is nothing sacred about pro wrestling. So don’t ever by anything you hear, by any denial from any professional wrestling organization. It is the nature of the sinful, deceptive beast of pro wrestling to deceive and continue to deceive. Let me throw this in about Bruno Sammartino. In August 2007 I was at the big convention in New York out on Long Island. I was talking to Terry Funk, my dear friend Terry Funk and we were talking about Bruno Sammartino. Terry Funk as you may have heard or read at that convention turned out to be a complete mark for Bruno Sammartino and his character. Let me tell you something. Bruno Sammartino, this man has never caused one public nuisance, incident as a professional wrestler. This man was a role model for fans and family to see how a professional wrestler can really be. You see what I’m talking about? This guy never threw any furniture out of a hotel room, never causes a disturbance, never got drunk in public, never did drugs, I’m just telling you that it can be done. Bruno Sammartino is the gold standard as far as character in professional wrestling and all sports. Eric – Terry Funk told me the same thing, recalling a story about Bruno working for Baba against pressures from Vince McMahon, Sr.
SG – I committed a major era when I publicly said that Bruno Sammartino was bitter and was treating his son David unfairly because of David’s alleged steroid use many years ago. I had misspoken and at this convention in Long Island I personally went up to Bruno Sammartino and I apologized to him one man to another man that I made a huge mistake by speaking publicly about people’s private lives. So I want to go on record and say that I have once again apologized to Bruno, he has in fact accepted my apology and we’ve moved on, because after all as I told Bruno, it was him passing the torch to me that solidified my career and established me as a future WWE Hall of Famer even though I was well on my way but it was that title, the gaining of that title WWWF champion that solidified my career to make it possible that you and I are talking today. Eric – What are your thoughts on the government taking a look at professional wrestling? SG – I think that Congress and the government especially in light of Barry Bonds being ushered into court as we all saw pleading not guilty to perjury, two counts of perjury and one count of obstruction of justice as a legitimate professional baseball player speaks volumes as to the culture that we live in. We expect professional wrestlers to be deceptive and the public does too because they know we are just entertainers and we aren’t a legitimate sport. However when it goes to the level of a Barry Bonds deceiving the general public, enhancing his performance and the government now with him, I think it’s the good for all of humanity period to try and eliminate drugs in professional sports.